There are many online tutorials that boot a pre-compiled kernel image with busybox to boot in QEMU. However, my school project requires me to examine the physical memory while running Firefox, a more complete operating system is needed. This will create a 5GB image with the qcow2 format, which incrementally increase the image size as you put more files on it. qemu-img also provide snapshotting, store directly inside the image file. Somehow the -boot parameters of QEMU looks a bit similar to DOS, you use c for disk, d for cdrom, and a or b for floppy. -cdrom and -hda are used to indicate CD and HD images. After booted to the Debian-installer, follow normal steps of installing a Debian system. QEMU will automatically provide a DHCP server for you VM. I'm not really going to explain the process of compiling the Linux kernel, but if you use the .config file from Debian kernel packages, its pretty difficult to fail. I'm using the linux-source-2.6.32 and the linux-header-2.6.32 packages from Debian. The last command will install the module files under /lib/modules. Now you will have produced three files that you will need in next step, they are initrd-2.6.32, vmlinux and arch/i386/boot/bzImage. 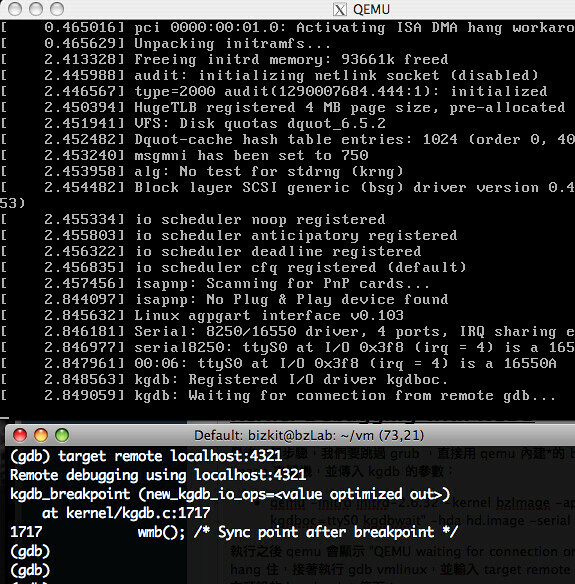 On the host machine, run gdb vmlinux and execute target remote localhost:4321 to connect to the kernel. Once connected your VM will continue booting and stop only if you have setup some break points. You can then use l to view currently running kernel source, use n to step through kernel code, or use b to add a new break point. For example, if you execute b printk, the kernel will break before every kernel messages, and you can use c to continue running the kernel until before the next message is printed.